Smart Sookmyung: True or False? From electronic attendance to student identification cards, information about reading rooms, DICA and other webpages, everything linked to Sookmyung Women’s University is easily accessible on one smartphone application: Smart Sookmyung. For Sookmyungians, it is their lifeline to everything at campus. It is deeply burrowed into every student’s survival kit at Sookmyung. However, does the app truly provide enough to be called “Smart”? ‘If the problem persists, please contact the administrator.’ You’ve likely encountered this screen more than once. Nevertheless, it is still Sookmyungians “go-to” in times of need. SMT investigates deeply into its functions and lack of it in this edition to determine whether it is truly a Smart Sookmyung campus app. Just a few decades ago, it was nearly impossible to see students carrying around mobile devices on campus. Everything, including attendance and student ID cards were all based on the analog system. However, with advances in technology, the campus environment has changed. 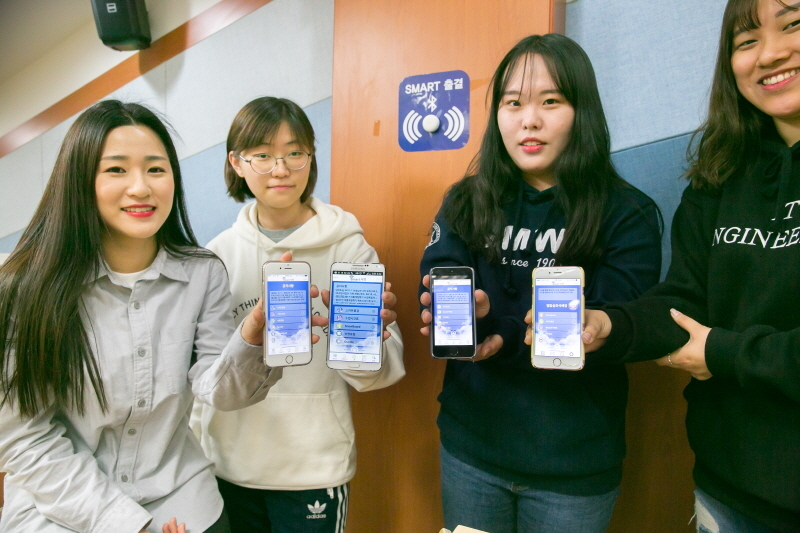 For instance, at Sookmyung Women’s University, students check their class attendance using the mobile app Smart Sookmyung. The Smart Sookmyung app is just one of the ways Sookmyung Women’s University has realized a smart campus. 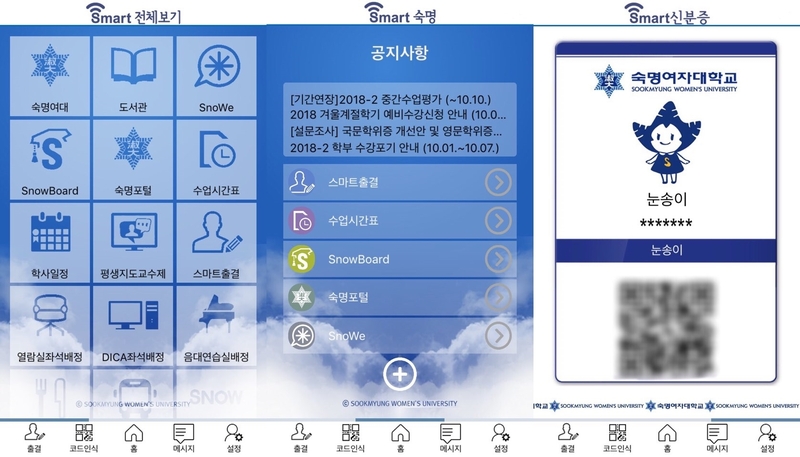 As Sookmyungians already know, Smart Sookmyung features storage of Sookmyung Women’s University’s student ID cards, the function to record electronically one’s attendance, and so forth. According to statistics from the Office of Information & Communications Technology, the total number of downloaders of Smart Sookmyung is 33,771 as of September 20, and the number includes undergraduates, graduate students, faculty members, and all users of the Main Library. Using only their Sookmyung ID number, anyone at Sookmyung can easily download the app from app store on their smartphone and start using the services on the app immediately. The app was first made in partnership with KT in 2014. Before its launch, students had to bring their ID cards to the classroom and electronically scan it on wall-mounted electronic machines in classrooms in order to record their attendance for the lecture. However, after the Smart Sookmyung app launched, students are able to record their attendance comfortably from their seat in the classroom. Like Sookmyung, many other universities have moved towards a "smart" campus by adopting new technology such as the use of smartphone apps, for it makes studying and working environments much more convenient and faster. Notable examples are in taking attendance. There are a number of different types of technology for recording attendance electronically through a mobile app. One type is the use of a class certification code, which students input into an app on their smartphone to record their attendance for classes they are attending. The beacon type uses the students’ mobile device to find its location by bluetooth. A third type is sound wave whereby students check their class attendance on their smartphone apps after the professor transmits a sound wave to the students’ smartphones. Sookmyung adopted the beacon type from the first semester of 2017. It was quite ahead of time. 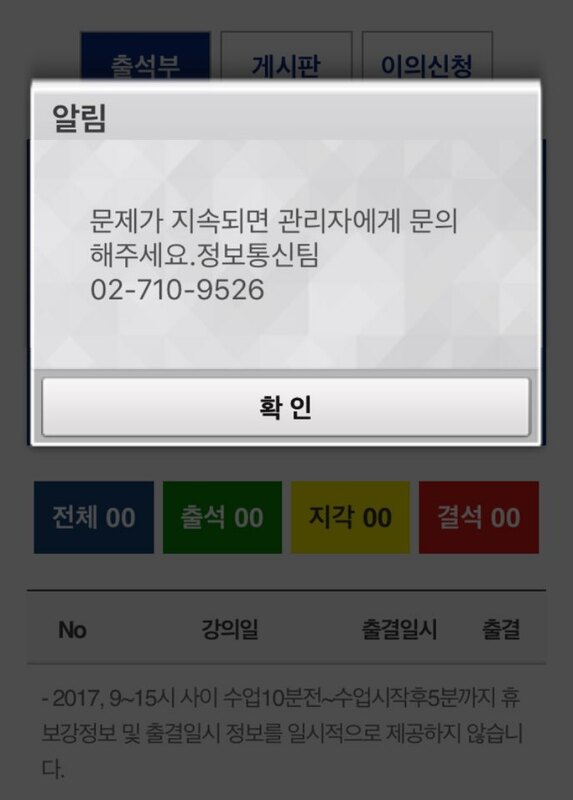 Besides attendance, the Smart Sookmyung app also helps students reserve seats in the library, keep an electronic copy of students’ ID cards, and provide a link to every website related to Sookmyung. With all necessities on one app, it is very convenient to perform various school related affairs. Sookmyung’s attempt to lead the way in technology is noteworthy; however, there are problems that Sookmyungians have raised that need addressing. According to a survey that The Sookmyung Times administered from September 15 to 20, 52.8% of Sookmyungians were dissatisfied or very dissatisfied with the Smart Sookmyung app. The biggest complaint was with the electronic attendance. 88.3% of Sookmyungians surveyed said they were unhappy with this feature. Despite use of new beacon technology to record attendance electronically, students said they had difficulty recording their attendance with their smartphone. There were complaints like being unable to upload the attendance page due to congestion; everyone was using the page at the same time. Na Yujin, Department of Social Psychology '18, said, “When I tried to mark my attendance for a class in the Veritas Building, the app on my smartphone said ‘absent’ for class.” After several unsuccessful attempts, Na finally managed to record her presence in the class. She received the message attendance recorded successfully. Concerned, she verified her attendance for the class with the app again, but it was recorded as absent for the lecture. Unfortunately her problem is not uncommon. Many Sookmyungians have experienced similar issues, especially in the first two weeks of this Fall semester. Some students have started to voice their anger claiming that Smart Sookmyung is not smart. Other concerns voiced by survey participants were the automatic turning off of the app, the long app loading time, and the app’s large size. Despite having the outlet to voice grievances due to app errors on the website of Sookmyung Women’s University, among the 68.8% of students who were dissatisfied or very dissatisfied with the app, no survey respondent filed their complaints. In other words, even though the students encounter errors using the app, they are reluctant to complain about the problem. Kim Yujin, Department of English Language & Literature ’18, said, “Although I have experienced errors using Smart Sookmyung such as loading time errors and electronic attendance errors, I don’t bother to file a complaint because I don’t know how or where to do it. Also, it’s a burden to do so.” Respondents who claimed to have filed a complaint said they were dissatisfied with the result because it does not get resolved. That is, the same problem keeps reoccurring. Also, they claim that it take long time to resolve problems. Learning of all these problems related to Smart Sookmyung, it seems that there is an urgent need for modifications so that it is truly recognized as ‘Smart’ Sookmyung. To find out the center of those bad situations on Smart Sookmyung, this SMT reporter met Jung Donghey, Head of Smart Sookmyung from the Office of Information & Communications Technology. Commenting on the errors encountered during electronic attendance recording and slow loading times of the app, she said, “98% of the time, the solution was to modify the user’s device settings. It only takes a few simple steps to make changes so that the device can be compatible with the Smart Sookmyung app.” Unlike the past when students could use various methods to record their attendance such as Quick Response (QR) Code recognition and Near Field Communication (NFC), from this semester, students only have the beacon electronic attendance method available to them to prevent abuse of the electronic attendance. Hence, most errors were due to incorrect device settings. For others, like the 2% who experienced errors due to a defective bluetooth function on their device, the only way to resolve the issue is to visit the repair shop according to Jung. For complaints about the loading time, Jung couldn’t really offer an explanation because it really depends on the individual user’s environment. “Yet, we are constantly trying to improve the campus network so that the issue is reduced.” At present, the university is upgrading the network to giga in Myungshin Building, the most frequently used building on campus and placing Access Point (AP) in each class. In the past, there were only one or two installed in the corridors, so a lot of things have changed for the better to ensure a good learning environment for Sookmyungians. Consequently, the current state of the campus network is being optimized without any server loading. When asked about Sookmyungians concerns that their complaints are being accepted after a long wait and also the same problem is recurring, she said, “We are the Hub1) to connect all services at Sookmyung on the app. In other words, our primary role is to contact relevant information like attendance to the Office of Academic Affairs and perform library duties for the Main Library.” However, for better user management, they offer several outlets for grievance even if they are not responsible for those functions. They listen to complains as offered through the app contact menu, take complaints at the call-in help desk, and welcome students who visit the Sookmyung 1·3·7 Center, which just recently announced its opening on the campus’ main homepage. While they aim to reply and resolve issues within 1 working day, if the issue is interdepartmental, it may take up to 3 working days. In terms of problems that reoccur, Jung said, “Some questions are asked repeatedly, so we created a FAQ section that details what to do for a number of issues, and students can find them at Sookmyung 1·3·7 Center.” Yet, low hits of FAQ views among Sookmyungians, Office of Information & Communications Technology dispatch their IT leadership group 'IT's U' consists of 50 to 60 members as an agent for monitoring Smart Sookmyung in actual campus life. Also, IT’s U regularly upload webzines about witty re-edit FAQ of Smart Sookmyung in Everytime so it’s better to check out. Hence, a number of different types of problems are constantly striving to develop and update its IT equipment so that things run smoothly. However, in the case of iOS, problems could take up to least three days because of process screening by Apple Inc. itself. Jung asks for Sookmyungians’ patience and understanding in these situations. All essential facilities and services that Sookmyungians need such as electronic attendance, student ID and library resources are provided on a single stable mobile app. However, Smart Sookmyung could be smarter. ‘It takes two to tango’, so for Smart Sookmyung to reach great heights and evolve into a truly representative service of Sookmyung Women’s University, there is a need to fuse new technologies and utilize the eyes of users making active use of the app to constantly monitor and better it. Once these two parts are united, this SMT reporter believes Sookmyungians will be "Smart" users of "Smart" Sookmyung. 1) Hub: A hub, also called a network hub, is a common connection point for devices in a network.